As soon as we announced that Leap of Faith was for sale, the questions started. What are you guys doing next? Are you getting a bigger boat? Are you buying an RV? Are you okay? Just why is Miss Leap for sale? We are moving into this log cabin in the Blue Ridge Mountains of North Carolina. We take possession August 1. It’s east of Banner Elk, near the ski lodges at Beech Mountain and Sugar Mountain. There’s an honest-to-goodness babbling brook running through the property. It’s very private. We’ll be doing lots of “porch sitting.” You can hear the brook from the back porch. It’s nothing extravagant, but it’s cozy. Looking forward to burning some wood. Kim is looking forward to that tub! The loft will become my new writing space, plus extra bunks for guests to visit. My daughter and grandkids are already making plans to stay with us for Christmas. What brought this about? I’d say it was a combination of factors. It likely started with Hurricane Irma. We spent a ton of money and hundreds of hours putting the pieces back together afterward. It was worth the effort as Miss Leap is better than ever, however, we started questioning things. First, we considered a bigger boat. We are spending much more time in the marina these days, appreciating the electricity, unlimited water and swimming pool. Why not get a nicer, newer boat? We looked at several, but I had a hard time coming to grips with parting with Leap of Faith. We put the search on hold. Skin Cancer: Somewhere during that time I got the first hunks of flesh removed. Six months later there was more cutting. A few more months and I had to do it again. This time Kim had to have some spots cut out. I felt more and more affected by the Florida sun and heat. What’s the point of living on a boat if you have to stay out of the sun all the time? The Cruising Life: The past seven years have been the best of our lives for so many reasons. It was truly a Leap of Faith that worked out for us. We did it. We conquered it. Sometimes we felt like we owned it. We made a name for ourselves in the cruising community. We overcame our fears and ventured out on one adventure after another. We put many miles under our keel. It’s been a very rewarding growth experience for us, but we’ve lost our wanderlust. We have no desire to travel to foreign ports in the Caribbean or elsewhere. We got the most out of our experience, and now it’s time to move on to something else. We want to thank all the special people we’ve met over the years who’ve enriched our lives. We’ve met our share of bums, but overall the cruising world is full of quality folks. My Writing: Between boat projects and an active social life, the distractions are many. I’m not the most disciplined worker to begin with. It’s easy to neglect my work with all of the activity going on around me. My plan is to seclude myself in the loft and write prolifically. I even hope to write a more serious novel that won’t include Breeze. I’d like to do a children’s book for my granddaughter, about a pirate dog! Who knows what I’ll come up with. I’m a writer when I’m actively writing. Otherwise, I’m just a guy who wrote some books. Look forward to lots of new stories from me in the future. Seven Year Itch: Kim and I have talked this through quite thoroughly. We’re both ready for a change. We’ve proven that change is not something we are afraid of. It worked out great seven years ago, no reason it won’t work out great again. If we find that the cabin life doesn’t suit us, well . . . we’ll just do something else. Ain’t scared. Once again, we both thank you all from the bottom of our heart for the support we’ve been given. You people help us keep our faith in humanity. Now excuse us as we go hide from you all in the mountains! This entry was posted in Uncategorized on June 9, 2018 by Ed Robinson. Have a great time in North Carolina! It is a wise man who realizes that it is time to move on. When a groove becomes a rut, it is time to go. A life adventure demands change and acceptance of new things. I will continue to read your books and look forward to doing so. We differ on politics, but not on the subject of an adventurous life. This is AWESOME!!! I talk about you and Kim daily . About your adventures and how it truly was “A Leap of Faith”. I hope you do write a children’s book , I will be first in line!!! Welcome to the beautiful state of North Carolina. We are in Asheville. Adventure always awaits in out mountains! Congratulations and good luck to you both. Health and hurricanes, two good reasons to move on. I wish you all the best in your next adventure. I understand the attraction of living in a cabin in the mountains. During at least half the year my wife and I live in the mountains on NH on a lake. Last winter our sailing plans were changed due to the hurricane. We did a lot of camping in a small RV instead. The current plan is get back on the water, but that depends on what happens this hurricane season. I do regret that we were never in Pelican Bay at the same time. It was a real treat to read about adventures in my sailing grounds. Looking forward to your next books. I wish you both the best of luck, the cabin looks great! I understand your move but will miss talking with you and doing shots of Siesta Key rum on the back of Miss Leap. It was a pleasure to get to know you guys! I’m sure that you will love the mountains of North Carolina! We certainly do, although we are only 6-monthers. 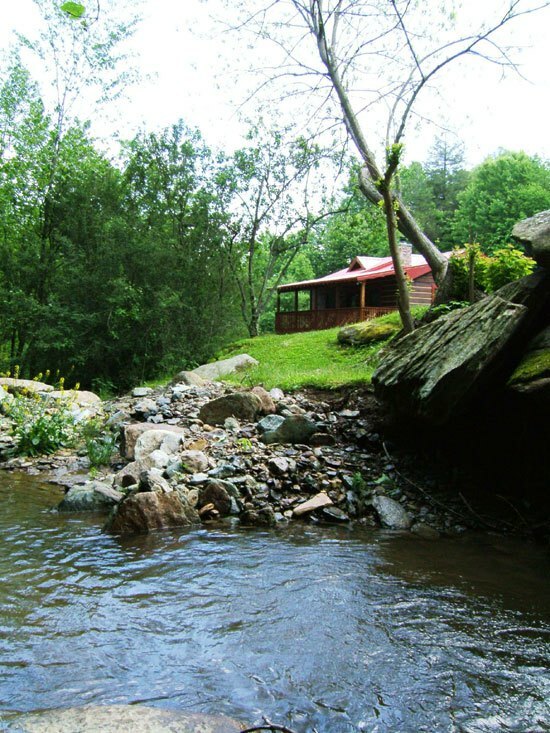 Our cabin is on 2 wooded, secluded acres in the Nantahala National Forest. Unfortunately you are about 4 hours northeast of us, but who knows, maybe we can meet 1/2 way near Asheville some day! Wishing you the best on your new adventures! Hopefully you’ll pound out a few more Trawler Trash books. Perhaps Breeze had a run in with pirates who were connected to ISIS or that drug dealer El Chapo and Miss Leap was stolen or sunk. Perhaps Breeze had to go on the lam with a ton of cash, was put into witness protection and is hiding out in the mountains of North Carolina. And then there was the mountain lion and the pot grow…. Trawler Trash was too good of a series to just let it die, maybe it just needs to take a new direction just like you and Kim. Best of luck on your new endeavors, I have so enjoyed Breeze and the Trawler Trash series. Good for you! Sionna’s crew is only three years into cruising, we’re not ready to stop, but we totally get that the time will come. Bravo to you for recognizing that you were done, and heading for your next adventure! I am truly happy for you and your bride. I cannot express my gratitude for your books and emails. I have a bromance with Meade Breeze. You have developed him so well in my mind that he lives within. I cannot wait for another series from you. I wish you and your bride nothing but the best!!! Thanks Jeff. Breeze ain’t done yet. Cruising south on the intracoastal this morning, I passed a boat named “Leap of Faith.” I immediately hailed them on the radio but they said they get this a lot. Same name, different boat. I thought maybe they were the new owners. We’ve seen a few others. No new owners yet. Today we happily live on a 53ft Hatteras (happy Wife) and its 100% thanks to you guys and your books. I cant thank you enough for changing the way we look at life.